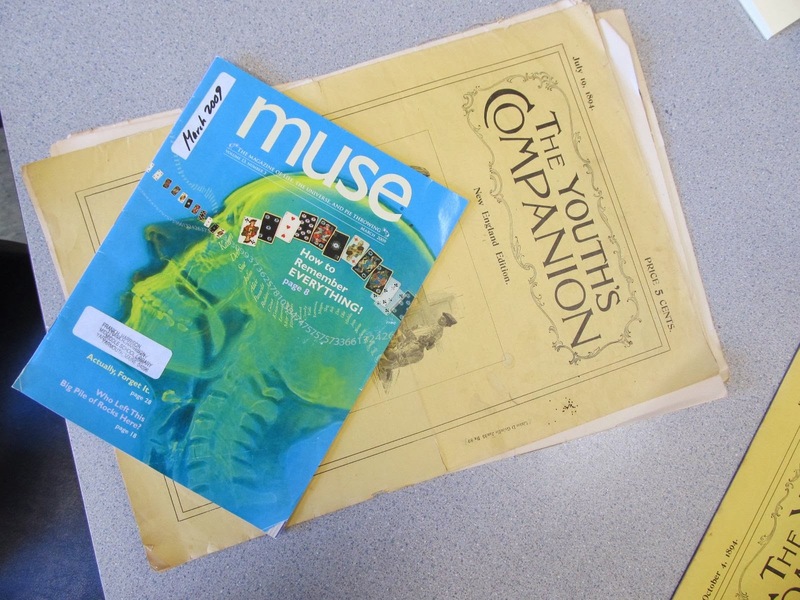 For our warm up today, the sixth grade group browsed The Youth's Companion, a publication from the late 1800's, as well as Muse, the modern magazine (of life, the universe, and pie throwing). We were looking for how writing for children has changed, and thinking about why it has. The stories in the old "companion" are so long and complex. There is no material submitted by children themselves! This investigation brought us into socioeconomic territory (did all kids go to school back then?) as well as much vocabulary....who would choose to buy an item advertised as "drab?" Did the word mean something different back then? We noticed that some things are constants: Webster's Dictionary, Quaker Oats, and that some things have faded away. What should your family take on vacation in 1900? A portable telescope! As always, Muse magazine could easily steal our whole session. Check out its online presence here, although sometimes hard copy is just so much better smelling! GT Parents Open House - Hold the Date!